Kodi Community Forum - Possible to change function of FF & RW buttons? Kodi Community Forum > Support > Video Support > Possible to change function of FF & RW buttons? Full Version: Possible to change function of FF & RW buttons? I am using Kodi 17.6 on Windows 7 & 10. Is it possible to change the function of the FF & RW buttons? Rather than have them seek at 2x, 4x etc..., is there a file to edit that can have them skip ahead, or back, by 60 seconds, or whatever time I would like? I use Kodi with a wireless mouse on my couch, and can skip ahead or back by using the scroll wheel, but it's not as precise. The action I'm looking to replicate is that of skipping ahead or back as in Windows Media Center. I know the keyboard arrows work well but it's not conducive to have a bulky keyboard while lounging on the couch. Or, if there is a mouse.xml code that can utilize a left/right double-click to assign skip steps, that would be awesome too. I have Googled for the answers all weekend and have found some code, but nothing the definitively made sense to me that would work. I've ssen doubleclick defined in the code, but then never implemented for any action...so I'm not sure how I'd go about defining left & right double-click - if it's even possible. 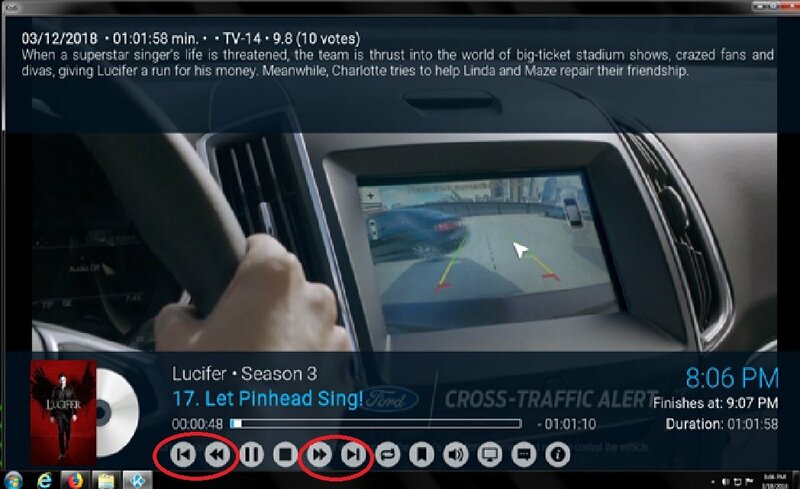 For reference, I've included a picture highlighting the on-screen buttons I am referring to. Alternatively try Seek(-nn) and Seek(nn) actions instead to use custom values, vice what you have in player settings. See keymap (wiki) for more. The doubleclick action works great with the right mouse button. The left doubleclick, though, doesn't work. I assume doubleclick id="0" is for the left button and doubleclick id="1" is for the right button since my right button is working as desired. Anyway, this is still a major help! I can easily skip ahead now. FWIW, with my personal Kodi setup/use, a mouse is all that's needed. No need for another special remote. I admit in this instance I didn't try it myself. Did some testing and I see what's going on. First, I think there might be a Kodi bug that it looks from the debug log that Kodi is processing both leftclick and left button doubleclick. That, and also mousemove inputs can cause Kodi to popup dialogs like info and videoOSD which then uses the default global mouse settings. One approach is to noop any mouse actions you don't want in FullscreenVideo (which IMHO is best) but I assume you need to have those other mouse events available so the best I could do is to add the SeekForward and SeekBack actions into the dialogs. This does work, but doesn't seem like a perfect solution. Had only limited time to really test it out so far...but it really seems to work nicely. Thanks for all your help!